21 June 2016. Rome. the TAP Secretariat organized a half-day symposium to discuss the findings of an e-conference which was held online from 18 April to 13 May 2016. This symposium also discussed capacity development for improving human nutrition and health. The event was live streamed in three languages (English, French and Spanish).The link will be active until almost 1 year after the Symposium. These four capacities are the core of an overarching “Capacity to Adapt and Respond in order to Realize the Potential of Innovation”, shifting focus from reactive problem solving to co-creating the future. This requires facilitative leadership to enable all of the above to happen. Increasing use is being made of innovation platforms, which are set up to facilitate various activities around identified agricultural innovation challenges and opportunities at individual and organizational level. How can the best structure and size of an innovation platform be determined in a particular project? Involving more actors can potentially increase the resources that can be tapped, but at the same time increases the difficulties of implementing collective action. Documentation and knowledge management are a core issue in CD for AIS. Considering that the AIS approach is a decentralized process and encompasses several dimensions, the task of identifying, capturing, evaluating and sharing relevant knowledge among stakeholders is much more complex than in traditional knowledge management approaches. Two particular important issues are what knowledge should be kept and who should keep it. These issues are related to the value of non-scientific knowledge (including procedures that adequately capture local knowledge), intellectual property rights and power within each innovation process. The Framework proposes a cycle of five stages for implementing CD for AIS. Given the importance of skilled facilitators in the CD process, it is vital that the process described by the cycle is accompanied by the identification and strengthening of individuals and organizations that can act as effective agents of change. They can be extension services, private consulting firms, university departments, capacity building organizations or NGOs. Which policies or instruments would be effective for developing capacities of food security and nutrition-sensitive Agricultural Innovation System (FSN-AIS) at the organizational and systems levels? Contributions to this questions emphasized the role of education and training programs, starting from youngsters, head of households, to agricultural professionals and policy makers. Once the capacities have been developed, how can they be kept strong despite changes in management and staff turnover? Could you mention cases where capacities were successfully built and kept for at least five years? What were the factors for success? The concept “institution” comprises a number of formal and informal ‘rules of the game’, including relationships between organizations, regulations and behaviours. Which are the most essential institutions that should be strengthened to foster innovation in FSN-Agricultural Innovation Systems and why? Local organizations are often not included in capacity development activities, which creates problems when implementation is decentralized. The private sector should also be included in capacity development activities. Which initiatives for developing capacities for FSN-Agricultural Innovation Systems are being implemented or planned in the country where your activities are devoted to the achievement of SDGs 2 (zero hunger), 3 (good health and well-being) and 12 (responsible consumption and production)? Which indicators would be relevant to measure improvement of capacities that support collective learning and adaptation in food security and nutrition-sensitive initiatives? The discussion highlighted how difficult it has been to find appropriate indicators of capacity development for FSN-AIS. One of the main causes of this difficulty is that indicators serve specific purposes and have meaning within specific conceptual frameworks (in other words, theories of change); therefore, different goals and different theories of change would indicate different indicators for the same process or intervention. Till recently nutrition problems in low and middle income countries were characterised mainly by undernutrition and micronutrient deficiencies. An additional form of malnutrition is now present in the same communities: obesity. 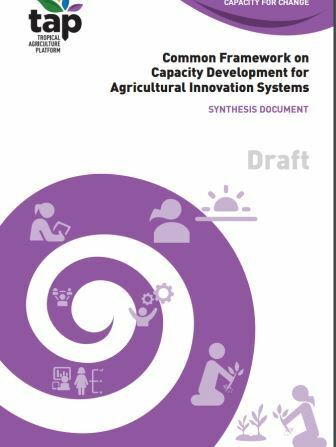 How can the framework for capacity development for FSN- Agricultural Innovation Systems be adapted to address the more complex nature of food security and nutrition issues? The following interventions to improve food security and nutrition were mentioned: education, campaigns to raise awareness about nutrition and lifestyles, involvement of nutritionists in agricultural projects and extension, and promoting urban agriculture. Awareness raising for nutrition can be done through for example peer-peer meetings and gatherings, and even more current and yet still poorly exploited, through mobile applications. When implementing the framework for capacity development for FSN-sensitive Agricultural Innovation Systems, how can the needs of often voiceless actors (e.g., small farmers, young people or female-led households) be incorporated and addressed? Elicit the needs of marginalized actors and open new opportunities for them. 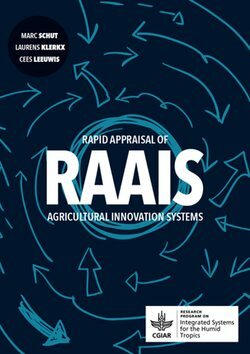 Rapid Appraisal of Agricultural Innovation Systems (RAAIS). A toolkit for integrated analysis of complex agricultural problems and innovation capacity in agrifood systems. Schut, M., L. Klerkx and C. Leeuwis, 2015.
the existence and performance of the agricultural innovation system. RAAIS can thereby provide specific Entry Points for innovation to address concrete problems experienced by farmers and other agripreneurs in a specific locality, but it can also provide more generic Entry Points for innovation to address constraints faced by policymakers and other scaling actors at higher levels.